Large collection of C functions for strings. from the SPARKIE RBBS at (603) 888-8179.
version of CSTRINGS.LBR will be mailed to you. occurrence of a character in a string. STRLOWER C Contains strlower function to convert a string to lower case. 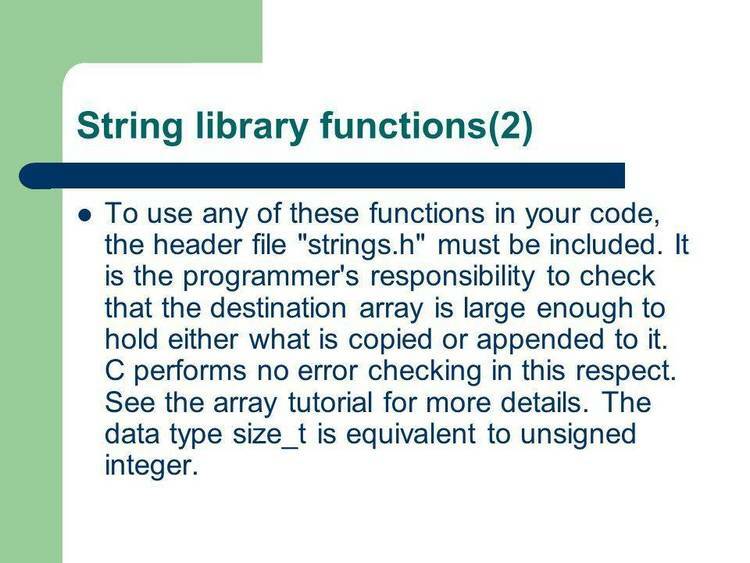 STRCAT C Contains strcat function to concatenate one string to another. STRLEN C Contains strlen to return the length of a string. STRCPY C Contains strcpy to copy a string. STRCMP C Contains strcmp to compare to strings. rightmost characters from a string. STRUPPER C Contains strupper to convert a string to upper case. characters from the middle of a string. STRREPT C Contains strrept which fills a string with a certain character. the left-most characters of a string. CENTERS C Contains function centers which centers a string. in the middle, left side, or right side. string in the middle, left side, or right side. is longer than n characters).